The tools and templates are organized under the steps of PRITCHETT's world-class M&A integration methodology. PRITCHETT Consulting Clients, Merger Integration Certification Workshop Attendees, and Website Subscribers can access all the tools and templates. 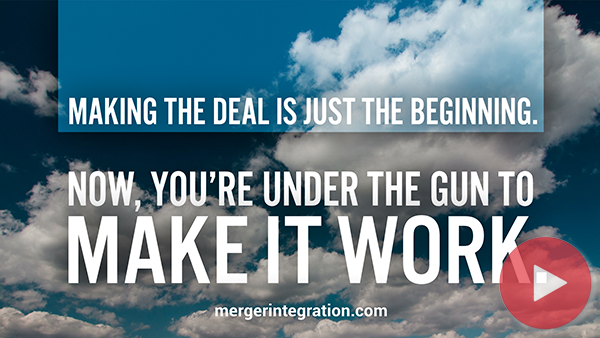 They can also access everything else-all the presentations, playbooks, books, articles, checklists, software, assessments, webinars, research, and videos on MergerIntegration.com. Roles of different teams, leaders, and task forces in a M&A integration are explained in this two-page document. An example of a RACI (Responsible, Accountable, Consulted, Informed) matrix that identifies roles and responsibilities for Steering Committee, IMO, Functional Teams, Synergy Owners, and Accounting. 2-page example on how the the M&A Steering Committee and Integration Team will work together to determine governance, their reporting relationship, the process for making decisions, resolving issues, etc. Instructions on how the Integration Team creates a Charter to document the mission, goals, scope, boundaries, and deliverables of the team. Plus a 2-page Charter example and 2-page Word template follow the instructions. 9-page exercise that includes background information on the Human Resources functions of two merging companies, HR organization charts, profiles of members chosen for the integration HR team, and a partially completed HR team integration charter to be completed by the reader. 9-page exercise that includes background information on the product development functions of two merging companies, product development organization charts, profiles of members chosen for the integration product development team, and a partially completed product development team integration charter to be completed by the reader. 9-page exercise that includes background information on the information technology functions of two merging companies, IT organization charts, profiles of members chosen for the integration IT team, and a partially completed IT team integration charter to be completed by the reader. 9-page exercise that includes background information on the sales functions of two merging companies, sales organization charts, profiles of members chosen for the integration sales team, and a partially completed sales team integration charter to be completed by the reader. Includes charter statement, team scope (compensation, benefits, performance management, staffing, training, policies, etc. ), key questions, deliverables, and critical success factors. Two page Word template for documenting a team Charter. HR team charter example in Excel. Example of completed risk identification and mitigation Excel template. Every review item in this template is used to help prospective investors develop a sense of expectations regarding a target company's ability to generate cash flows and to understand the degree of risk to which those cash flows are subject. An inquiry into the day-to-day operating fundamentals that reflect the cultural basics of how the business is run. A survey focused on cultural traits often determined to be mission-critical. An assessment of how an organization’s culture influences its ability to function as an adaptive system. 17 questions about the current situation, company identity, perceived culture of both companies, and the expected changes as a result of the merger. This 14-page document includes actual responses that run the gamut from expected answers to unexpected responses which need to be addressed. Evaluation criteria in this 3-page Word document includes feedback to the HR/OD Team on The Team Charter, Plan, Organization Comparative Analysis, Future State Recommendation, Day 1 Items, Risk Analysis, Early Wins, Cost/Benefit Analysis, Outstanding Issues & Decisions, and Communication Plan. The 1-page Word template is used document additional questions, issues, or action items requiring follow up after a planning meeting. A Task Force may feel overwhelmed by the large number of identified initiatives. To assist a team on how to prioritize activities, we provide the criteria to evaluate projects and the Priority Initiatives Template. 20-page document is a plan that covers organization comparative analysis, future state recommendation, day 1 items, risk analysis, early wins, outstanding issues & decisions, and communications. Template used to update the status of workstreams and plan for the near term future. Example in Excel track the Sales workstream status. The two-page document is an example on the data collected by The Steering Committee, Integration Team, and Task Forces about what went well during a merger and what should be changed for the next Integration. The two-page Lessons Learned Word template is also provided. The Steering Committee, Integration Team, and Task Forces collect information about what went well and what should be changed during the next Integration. This meeting should be conducted before the Integration teams have disbanded. Lessons Learned should be fed back to the next Steering Committee and Integration Team for the next Integration Planning effort. Two-page example and two-page PDF template.